I went on a fact-finding mission, checking to see if the workstation actually communicated with the license server. You do this by checking the debug file. If the workstation did try to check out a license, it would leave an entry there. As I expected, there was no entry. I then went back to the workstation and disabled the Windows Firewall. Problem Solved! It turns out that a recent Windows Update actually made the firewall block ports needed by the license server. The fix? I’ve said it before, and I’ll say it again… You can beam yourself back after you left Starship Enterprise. Okay, I’m not talking about Captain Kirk here, but rather users who disconnected from their offices and left for some sunny location to “work” and subsequently converted their licenses to standalone. Now that they’re back to reality and need to be back onto network seats, a quick and easy change in the registry will fix do the trick! NOTE: The value ACAD-xxxx may change depending on your AutoCAD vertical. 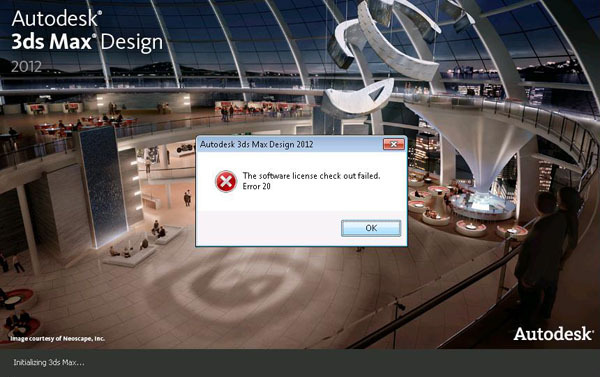 The example above is for AutoCAD Civil 3D 2013. With every release comes a new deployment image so I thought it might be helpful for IT/CAD/BIM managers to see it done first. I’ll be making a deployment image for Revit Architecture 2013 on my Microsol Resources DFS, configuring the deployment image using central location for all templates and content. This way, all my users / Application Engineers (AE) / Support Personal / Trainers & Instructors will all get centralized content. This is especially good for larger firms since standardization is one of the keys to an efficient production environment. Got Windows Server 2008 R2? Got virtualization plans? If so, check out the latest video. You can install FlexLM on guests running on Hyper-V or VMware. For this video, I’m going to be installing FlexLM using VMware Workstation, with a Windows Server 2008 R2 guest. It’s always recommended to ‘hard code’ your virtual guests’ MAC address so it doesn’t change. Complete setup and configuration in just over 6 minutes to get your license servers up and running, and your users back to work. Note down the existing settings onto notepad and copy the files (especially the license file) off to a backup directory. You do not want to mess up and delete your license file!!!! Remove the old version via “Programs and Features” in Control Panel. You can also stop the service manually and do an “in place” installation. Click on the MSI file and follow the installation wizard. It’s as simple as clicking next a bunch of times. Once it’s installed, make sure the initial check box, “LMTOOLS ignores license file path environment variables” is checked. 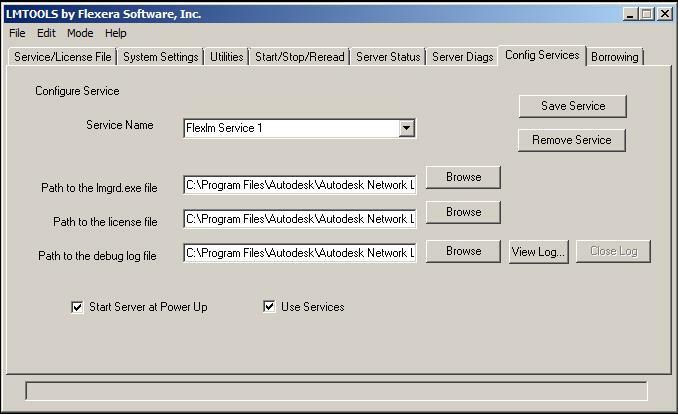 To configure as service, go to the CONFIG SERVICES tab and point/browse to those locations for LMGRD, LICENSE FILE, DEBUG FILE (you have to get the license file from Autodesk and create a debug.log file manually). Make sure the two check boxes are checked and click on SAVE SERVICE. Go to the Start/Stop/Reread tab and click on the Start Server button. Once the status shows Server Start Successful, go to the Server Status tab and click on the Perform Status Enquiry button. VOILA! You’ll see all the licenses available to you in the status window! It hasn’t been long since we’ve partnered up with Chaos Group to offer V-Ray and my-oh-my, there has been a lot of interest! One of the common questions I get is about those pretty blue dongles. We’re all used to setting up FlexLM to manage licenses, but all Chaos Groups’ V-Ray licenses are managed by a USB dongle. So how does it work, how will my network be affected, how will our firms’ licenses be managed? Well, here’s a quick little video that demonstrates how to install the license server and then making sure the dongle is [properly] read by the workstation (I’m using a Windows 7, 64bit machine for our licenses). It’s not as easy as just sticking the USB in so before you jump in, it’ll be good to check the video out. I get a common question on how to make users from multiple offices share the same drawings seamlessly. They want to be able to work on files stored in New York while working from Seattle just as they were in the New York office. 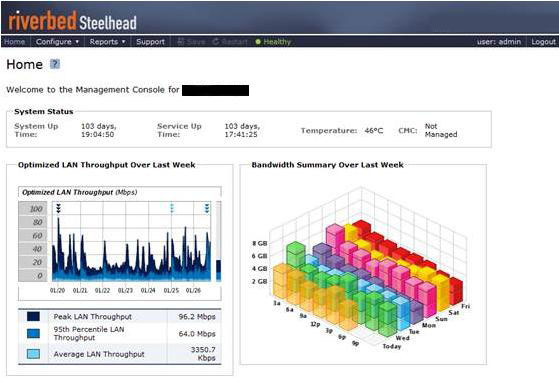 In the realm of WAN optimization, the biggest player is Riverbed Steelhead. Autodesk works directly with Riverbed and many firms already have it in place, but it’s important to know what actually happens. The appliance takes data across the wire and caches it, sending only bits that haven’t been sent (incremental changes). The first 5MB file you send will take 1 minute (cold). If someone requests the same file later, that transfer will take 10-20 seconds (warm). The older DWG file format (2007 and older), along with older Autodesk software, does the full file swap when saving, negating any benefit from appliance. Change the “Incremental Save Percentage” (ISP) inside AutoCAD to 50. Use the 2010 DWG format! Why? The 2007 DWG format are not optimized. When you do every open/save, all the bits inside it are rearranged, data de-duplication technologies can’t recognize them, and the entire file looks new to Riverbed’s data hashing algorithms. 2007 is sooooo 2007. Last time I checked, it is not 2007 anymore. Another interesting tidbit is that if you analyze the data from your Steelhead, besides AutoCAD files being optimized, a lot of the benefit comes from other things are being optimized. You’d be surprised how chatty software is. Just came back from a client visit and the project this time was helping to upgrade their license server. Pretty straight forward stuff, but I’ve come to realize that what I do as “straight forward” is actually pretty impressive to quite a few people. We all know [at least you should if you follow my blog] that there are three spots that Autodesk uses to define where the license servers are. These are read that in that order, and when the system finds the key (ADSK_LICENSE_FILE), it will stop and put it to memory. So how does it affect my deployment? Well, if you have a license server (let’s call it OldLic1 and OldLic2) already serving up licenses and you want to upgrade/retire it and move licenses to your new, awesomely robust virtual server (NewLic1 and NewLic2), most people think you need to touch every workstation to update those values so that AutoCAD and Revit will get license from the right servers. NOT! With the all-powerful Group Policy Management Editor and some nifty GPOs, you can make the change to all your workstations to all your branches… at once. Yes, we did this to well over a thousand machines for this project, even to their branches, WITHOUT having to touch every single machine. Thank goodness too, cuz I would’ve gone crazy! 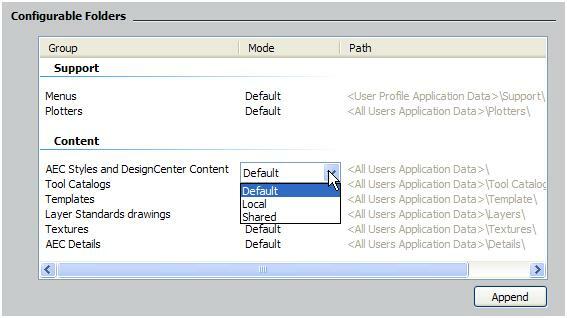 So what is the difference between default, local, and shared when you deploy AutoCAD / AutoCAD Architecture? Both default and local stores onto your local workstation; the difference is that you get to pick where you want it to go (local) and keeping content data like AEC styles and DesignCenter Content in the ProgramData folder (default). If you specify the same location for subsequent installations (not deployment), you will be prompted to overwrite the existing shared content files. If you create a deployment with shared content, the content files are written to the shared locations when the deployment is created. This “one time deal” installs content for all Content Packs to the shared location so make sure it’s large enough. Thankfully uninstalling the software from one workstation does not remove the content from the shared location. Imagine the headaches that would’ve happened if that was the case! Craziness!